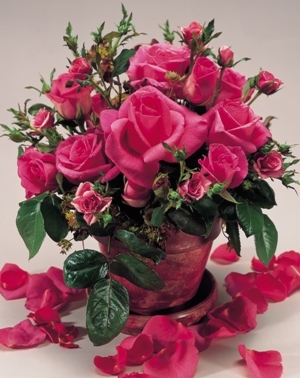 A 6″ terra cotta holds a freeform bouquet of both garden and spray roses. It different, it’s unique, and comes with a mini bag of scatter petals. We love petals to scatter. 75. App. 12-14″ tall available in assorted colors of the week. If you have a secret message or want one…check the rose meanings first.